The TV documentary is about the former Asarco smelter in West El Paso. It contains footage from a dozen cameras that recorded the April 13 demolition of the 610-foot smokestack and the iconic 828-foot smokestack. The smelter operated as an American industrial giant for more than 110 years. The American Smelting and Refining Company, better known as Asarco, was closed in 1999, never to reopen. After the company declared bankruptcy, a court-appointed trustee was given the task of disposing of the smelter’s assets, demolishing its facilities and remediating the former smelter site. Capstone Productions requested permission to video record the entire smelter plant before demolition, and began that huge process in May 2010. As a result, hundreds of hours of video have been recorded and thousands of still pictures have been captured, images that enabled Capstone Productions Executive Producer Jackson Polk to create the first of three planned one-hour TV documentaries in the series about the former smelter. 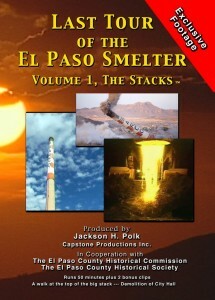 This first documentary, “Last Tour of the El Paso Smelter, Vol.1 The Stacks” includes the demolition of four stacks that stood on the property – the 150-foot antimony stack, the 300-foot acid plant stack, and the two larger concrete stacks that came down on April 13, 2013. The main focus of the first program is the landmark 828-foot stack. The material includes a two-man climb to change the aircraft lights, engineering plans for the stacks, and a tour through the base of the large stack. Viewers also get to see the preparation for the demolition of the two large stacks, which was the largest TV coverage event in El Paso history. We also get a tour of one arroyo remediation project at the former smelter site that most people don’t know about, and a preview of the next film in the documentary series.